This was my first foray into the wonderful world of Kimpton. I had heard good things, but honestly did not know what to expect.I suppose I did not know what to expect from a franchise boutique hotel. To some this may seem like a bit of an oxymoron. The Grand Hotel exceeded my expectations from begininng to end. 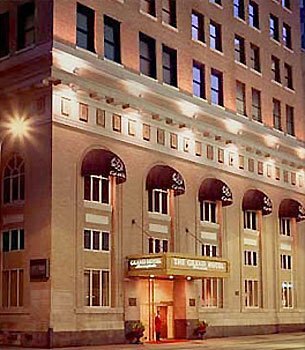 The hotel is right downtown and easily accessible to offices in the area, as well as, Nicolet Mall where you can find great restaurants / bars. The hotel staff was courteous and helpful and the gym is a full blown LifeTime Fitness with running track and lap pool (8 ft in the deep end) – unparallel for equipment, facilities, and operational times for a hotel. I was given a lovely corner suite on the top floor. It was one of the most comfortable beds I have ever slept in. Usually it takes me at least a night to get comfortable. The bed and linens were heaven. If I had to pick ot one small shortcoming it may be the after hours food service. They had a nice menu for room service, but a good portion of the nibblies were unavailable the first night. What I appreciated was their efforts to correct the situation. My second night they sent up a wonderful tray of chips and spreads. This is absolutely a 4+ star boutique hotel. Everything about it was superb from the staff to the room and amenities. The room was amazing. TV in the bathtub! Super comfy bed and heavenly robes. The decor is warm and classic elegance. The staff was very welcoming and helpful. All of our requests were met effortlessly. Our room was comfortable and immaculate with everything in perfect working order. We enjoyed the lounge as well as breakfast in the restaurant the next morning. I look forward to visiting the Grand Hotel again.